The BIGGEST Indie Music Event in St. Louis! Click here to see the complete schedule, menus from all the Nosh Pit restaurants, and vendors in the Retail Scene. Also check out the festival map to locate the Schlafly Beer Garden, Spotify tour bus, and much more. 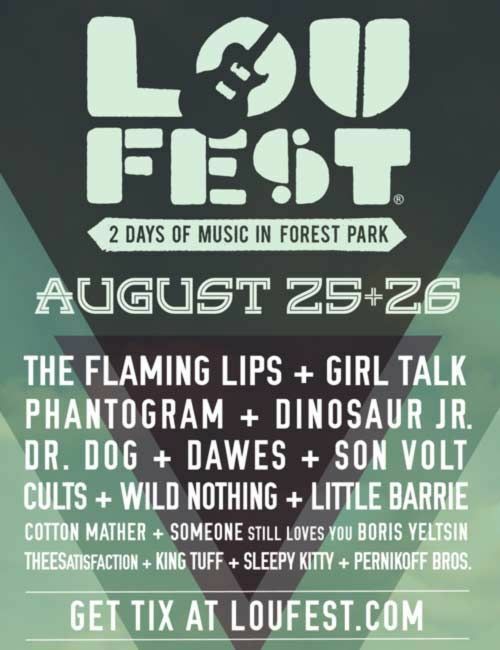 LouFest weekend wouldn’t be complete without official before and aftershows. This year’s pre-party is Friday, Aug 24 at Off Broadway and features Dressy Bessy with Cotton Mather and Middle Class Fashion. Get tickets for only $8. When Forest Park goes dark we’re just getting started. Head to the official aftershow to keep the party going late into the night. This year it’s Little Barrie with The Orwells and Audacity at The Firebird. Tickets are only $10, or better yet, only $5 with your LouFest wristband. Advance tickets available. Sponsored by PBR. 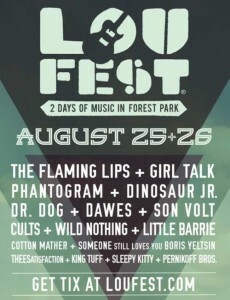 Don’t have your Loufest tix yet? Avoid long lines at the box office by getting them here . You can choose will call, print at home, or go old school and have them delivered. Two Day passes are $70, Singles are $40.